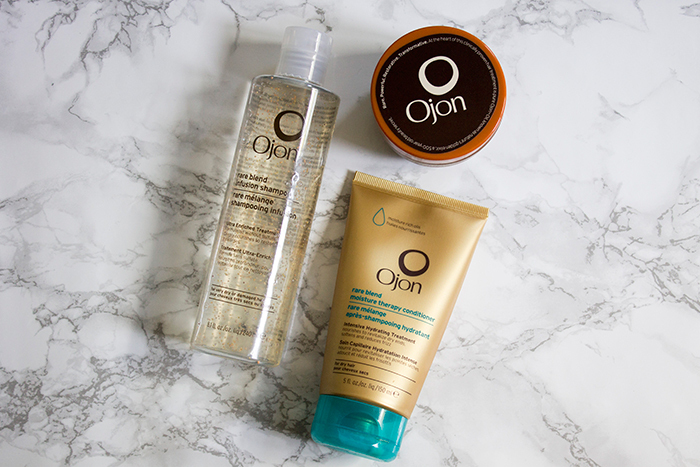 When I first tried products from Ojon, I was instantly hooked. If you've never came across the brand before, they're big on the power of oils and believe in a gentle approach to haircare without the stripping qualities you'd find in other brands. Basically, more nourishment, less nasty stuff which is pretty straight forward. I've recently been trying out some new additions to their Rare Blend collection to review so you can find out more about the products. First up is the Ojon Rare Blend Infusion Shampoo which on first glance looked very intriguing. I wasn't all that sure about the use of the beads as microbeads are said to be bad for the environment. However the nature of these beads mean that they actually burst on impact so they don't actually leave any trace and dissolve with water. The formula itself is made for very dry to damaged hair and contain no sulphates. Perfect for coloured hair that needs an extra dose of nourishment. Without the use of sulphates I thought it might be difficult to use but the shampoo foams up really well and it's very easy to wash out of your hair, even the little beads. It leaves my hair feeling very nourished but clean at the same time without any build up. To use alongside the shampoo I've been using the Ojon Rare Blend Moisture Therapy Conditioner to nourish the ends of my hair. It's a really rich conditioner which contains Ojon oil, Coffee Seed Oil, Sunflower Seed Oil and Babassu Oil so there's a great mix of antioxidants and ingredients enriched with lipids to really nourish your hair. Despite all the oils, it's actually very light on the hair which makes it incredibly easy to wash out but still lock all of that moisture in. It's probably one of the best conditioners I've ever tried and a great match for the shampoo. Usually I find that the shampoo and conditioner are enough to nourish my hair alone but every now and then I like to deep condition with the Ojon Damage Reverse Restorative Hair Treatment. I've actually had this for much longer than the other two products so I'm much more familiar with how it performs. It's basically an oil in solid form which you apply all over dry hair which you can leave on for 20 minutes or use it as an overnight treatment. It's very rich and you actually need a pretty strong spoon to even scoop out the product. Scent wise, I'm not too sure about it. It's not the most pleasant of scents so not everyone will like it but I've really grown to like it, it's sort of a nutty, cocoa buttery scent. If this can't nourish your hair, I don't know what will.